Red beans and quinoa are healthy, slower-burning carby guys that are gentler on your blood sugar. 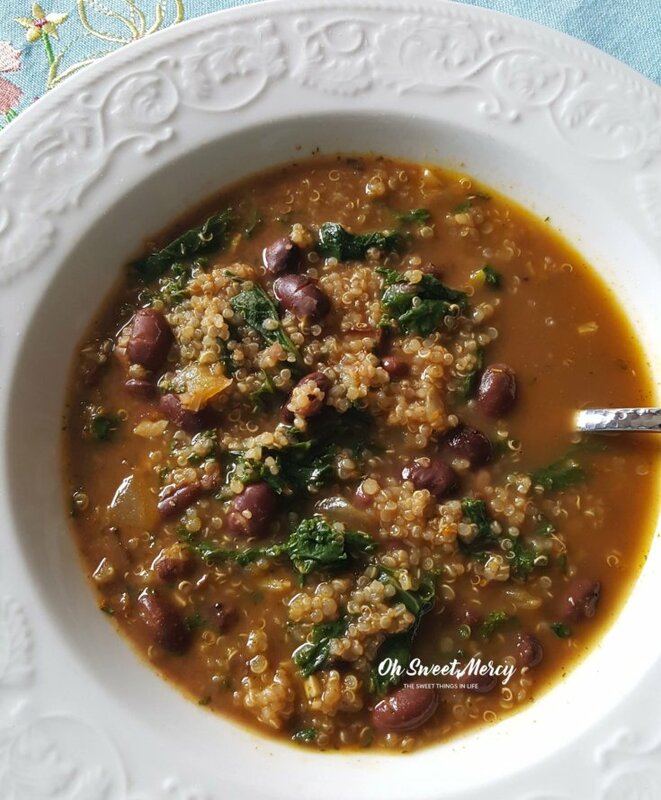 Simmer already-cooked beans and quinoa in broth, throw in a big handful of kale, add a nice layer of heat (plus a surprising ingredient) and you’ve got a quick, delicious, and healthy low-fat soup. 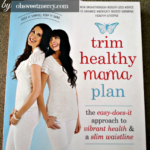 A great meatless option for vegans, vegetarians, and thrifty Trim Healthy Mamas. If you prep-ahead and have beans and quinoa in the freezer, this soup is super quick and easy! I know the calendar says it’s Spring but in typical form, Northern Indiana is still confused about what the weather should be these days. Today was a cold, rainy, dreary day more reminiscent of fall than what should be happening after the Vernal equinox! Since the time change a few weeks ago, I have been all out of sorts. I’m not sleeping well. I fumble through my days in a daze. And that “going to bed at a decent time” that happened after I started taking Ashwagandha root, an adaptogenic herb, around the first of the year? Yeah, well. That’s totally out the window. As amazing as this adaptodgen is, it is apparently no match for a messed-up Circadian rhythm. I can say, however, that I’m considerably LESS crabby this year which is a definite improvement. Many people seem to “adjust” after a week or so, but I am not so fortunate. Eat Well, Feel Well, Remember? 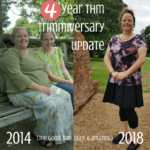 I often use the hashtag #eatwellfeelwell in my Instagram posts. Because it’s so true! 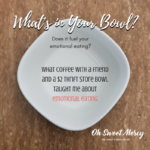 When we nourish our bodies they tend to work better and, consequently, we feel better. In The Comfort Food Myth, I also address that very thing. 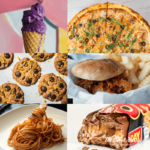 Plus give you over 150 healthy recipes for your favorite “comfort food” cravings! It hit me today that since I am muddling through each day in a daze I am probably not eating quite like I should. Or just remembering eat, for that matter. Do you ever forget to eat? Sounds crazy but it happens, especially when your brain is not firing on all cylinders. Thyroids need those healthy carbs to function well. 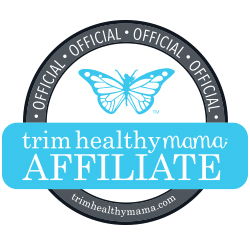 The Trim Healthy Mama plan is a great way to get those nourishing, healthy carbs into your body without expanding your waistline. And, contrary to popular belief, they can help make your waistline shrink. 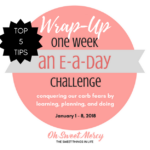 The challenge I did at the beginning of the year really helped me break through my carb fears. It also showed me that I do, indeed, need MORE carbs in my diet. So when I start craving starchy foods, I listen because my body is saying give me carbs! Today had me craving beans again. Actually, I was also craving sweet potatoes and wanted to make these yummy Cilantro Lime Sweet Potatoes from My Table of Three. It’s really an easy recipe, but I just did not have the energy or mental fortitude to pull it off today. But for real, they are amazing. Go make them!! I had them for breakfast one day with salmon and oh sweet mercy, so good! Quick And Easy (Especially If You Prep Ahead)! A quick rummage through the fridge and freezer and I was throwing together this soup in a flash. Having pre-soaked and cooked E-friendly carb sources like quinoa, brown rice, and beans on hand makes meal preparation a snap. I’ve made a similar soup on many occasions and it is always delicious! If you have an Instant Pot, check out this post on making perfect, fluffy, soaked quinoa in it. It works perfectly every time and is a great way to prep ahead. Why soak beans and grains? It reduces antinutrients, making the food more digestible and nutritious. Read more about it at Traditional Cooking School here. Even if you don’t have them cooked ahead, or want to soak them, this soup is still quick and easy to prepare. Quinoa cooks quickly and store-bought canned beans will also work. Increase the amount of broth by the amount of water you need to cook the quinoa on its own and you can add uncooked quinoa right to the pot. 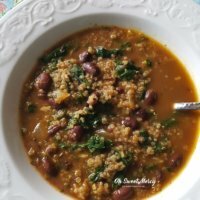 What “Surprising Ingredient” Is In This Red Bean & Quinoa Soup? Believe it or not, baobab powder! My favorite brand is the THM Baobab Boost Powder, I think it has a cleaner, brighter flavor and it seems to mix into liquids better. But when I’m out and can’t get a THM order in I do get this brand at WalMart. Most of the time I use baobab in sweet situations, like my Cranberry Orange Baobab Muffins or my Super Simple 4 Ingredient Baobab Water. I also add it to smoothies, shakes, and kefir drinks. So why add it to soup? Well, to be honest I saw that the Sisters added it to their soup so I thought why not? We can always use a Vitamin C and mineral boost (plus healthy, prebiotic fibers for gut health) right? I discovered it also adds a very slight bit of tang to this soup and makes it delicious. If you don’t have baobab powder, that’s fine too. Totally OK to leave it out but if you have some, give it a try! Healthy + Tasty + Thrifty = Winner! Finally, I must stress the thrifty aspect of a dish like this. Beans are super thrifty (and healthy). If you don’t have (or like) quinoa, soaked and cooked brown rice will work just as well. Making meatless meals can really help keep the budget in check! One note — the particular bag of cooked beans I grabbed out of the freezer also had a healthy amount of thickish juice. It has great flavor (especially if you had seasoned the beans while cooking) and adds an element to this soup that may not be there if you just use broth. No worries though, it’s still delicious! If your beans don’t have a lot of juice with them you might want to add more broth (and seasonings). However you make this soup, you’ll be satisfied and nourished! 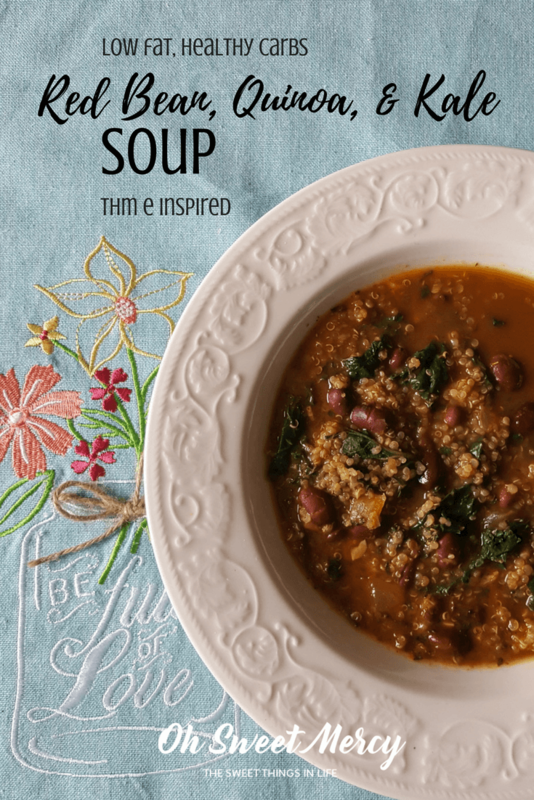 Simmer already-cooked beans and quinoa in broth, throw in a big handful of kale, add a nice layer of heat (plus a surprising ingredient) and you've got a quick, delicious, and healthy low-fat soup. A great meatless option for vegans, vegetarians, and thrifty Trim Healthy Mamas. If you prep-ahead and have beans and quinoa in the freezer, this soup is super quick and easy! Melt fat over medium high heat in a sauce pan. Add onions and saute for around 5 minutes, or until onions start to become translucent. Add fresh garlic and saute for 1 to 2 minutes. Add beans, quinoa, chicken or vegetable broth, and seasonings. Bring to a gentle simmer and cook for a few minutes while you prepare the fresh kale. If using dry quinoa, cook for 10 minutes or until the quinoa is tender. Before serving, add chopped kale to the pot and stir well. Remove from heat and cover for a few minutes, until ready to serve. If your home cooked beans don't have a lot of liquid, you may want to add more broth. Bone broth is nourishing and healthy, but if you don't have any feel free to use store bought broth. This makes a nice, hearty soup. You can stretch it farther by increasing the broth. Adjust seasonings as needed to taste. This is a low fat, healthy carb recipe aka an E meal. You might want to have more protein with your meal. You can add lean meats such as chicken or turkey breast, cooked ground venison or extra lean ground beef, or have an E-friendly shake or smoothie for dessert. You can also have a mug of hot tea or coffee with added collagen. FAT GRAMS CALCULATED IN NUTRITIONAL INFORMATION INCLUDE THE FAT NATURALLY PRESENT IN QUINOA. THIS DOES NOT COUNT AGAINST YOUR ADDITIONAL FAT GRAMS FOR AN E MEAL. There are approximately 2.3g added fat per serving due to the addition of red palm oil so you can have a couple extra grams of fat elsewhere in your meal if you like. Nutrition information is approximate and based on the best knowledge available at the time of recipe publication. Your results may vary due to differences in ingredients. 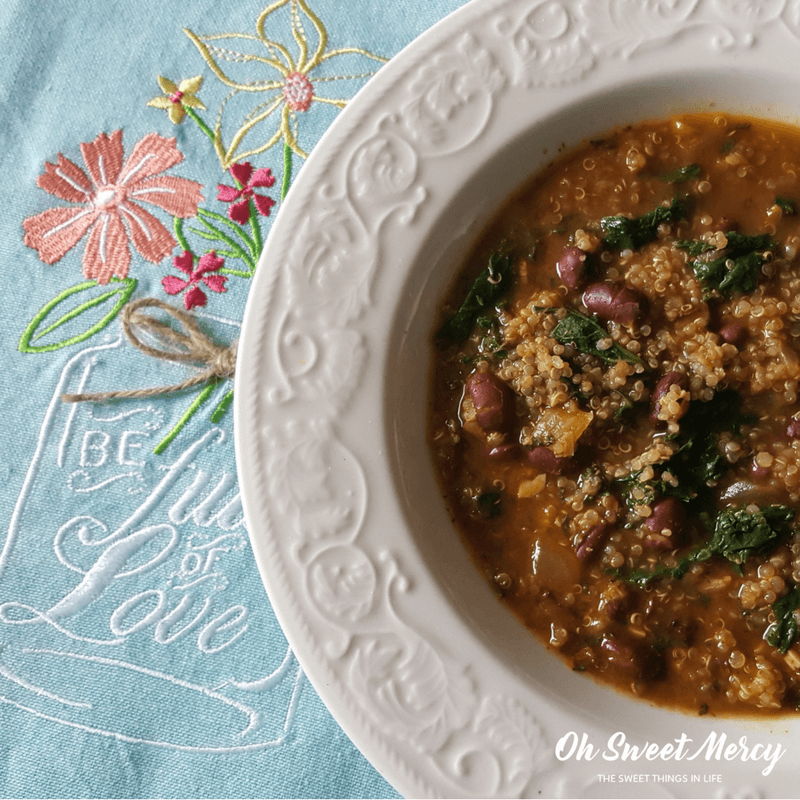 Don’t Forget to Pin This Red Bean, Quinoa, and Kale Soup!